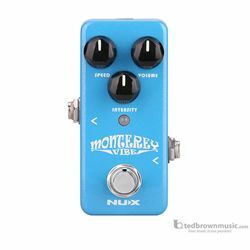 NUX Monterey Vibe generates a truly unique effect tone; a mix of chorus, tremolo, rotary, and phaser. This unique tone can be found in Pink Floyd’s "Breathe", Robin Trower’s "Bridge of Sighs", and the haunting audio mood created for "Machine Gun" by Jimi Hendrix. The earliest Uni-Vibe effect pedal came out in the 1960's. Cutting-edge guitarists were seeking a replacement for the heavy rotary speaker amplifier--configured from a standard amplifier for the electronic pipe organ. The original Leslie speakers did have a charm of their own, but it was more than compensated for by gaining the phaser effect, and the ease-of-use of a simple pedal configuration.